While the NHL and the NHLPA may or may not be making significant progress toward saving the season, hockey rages on abroad. Hopefully I'll have reason to stop doing these posts soon, but in the meantime, here's your second weekly KHL fix. CSKA Moscow: The Red Army. 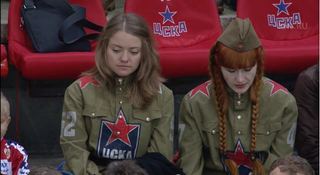 CSKA is the Yankees of European hockey. And in True Yankee™ fashion, they added the expensive Alexander Radulov, the consensus best player not in the NHL (save a late-season, contract-satisfying cameo with the Predators). Radulov is basically the Babe Ruth of the young league, setting most of its important offensive records so far. And now, thanks to the lockout, he's joined by two world class linemates in Pavel Datsyuk and Mikhail Grabovski. With Datsyuk and Flyers goalie Ilya Bryzgalov, CSKA also boasts the two most universally beloved Russian players in the world. Vityaz Chekhov: The goon squad. When people press Gary Bettman about fighting in the NHL, he breaks into a familiar tap dance about how it's already technically illegal. It's a hypocrisy the NHL is careful to downplay after the deaths of Derek Boogaard, Rick Rypien, and Wade Belak. The KHL embraces hypocrisy, though. Last year, after a horrific sucker punch from Vityaz's North American goon Jeremy Yablonski, the KHL supposedly discussed a rule change that would require all North American players to have 80-120 games of NHL experience. The rule meant to discourage career AHL fighters from bringing their senseless brand of violence to the KHL's hockey utopia. KHL rules are really just suggestions, though. Before this season, Vityaz supplemented Yablonski's thuggery by signing Trevor Gillies, he of just 57 career NHL games, and arguably the most loathsome goon in all of hockey. The KHL's response? They filmed a mini-documentary about Gillies' big fight against Astana Barys's Jon Mirasty, and they interviewed Yablonski for it. It's amazing what a league can do when they don't pretend enforcer fights aren't semi-scripted sideshows. The most telling parts of the video? Gillies admits he couldn't sleep before the game, harkening back to Derek Boogaard's sleeping pill problems. And Mirasty has to explain to one of his European teammates that they can't have the fight after a goal. After all, according to the Playstation logic that justifies the continued existence of the enforcer, you wouldn't want to give them back the momentum. What horrifying thing Alexander Radulov saw on player photo day, he would never tell another soul for the rest of his life.